Once dry, apply a new coat of paint to finish the repair. PROPERTY NEWS - If you're the owner of a newly built home, you may be disconcerted to find small cracks developing around an area in your walls known as an expansion joint. These settlement cracks are perfectly normal and occur as a result of your new home - and all of its weight - settling in on its foundations. "Every new building will settle, but with the correct building process and expansion joints, the cracks will be limited. This 'settling' process can take up to three years and is a normal part of the change in temperature, the drying out of the cement, plaster, bricks and so on. In additional to the typical settlement, buildings are also subject to thermal movement. This means the building will expand and contract depending on the temperature of the building materials incorporated into the structure, as natural materials being used expand and contract just as they do in nature. All building materials are subject to this type of movement," explains Mbuso Mahlanga of Cosmopolitan Projects, one of South Africa's largest developers of affordable housing. Expansion joints are intentionally built into the walls to ensure that the different sections of the walls can move independently of each other, without compromising the strength or integrity of the walls. An expansion joint is usually formed in a straight line, at intervals, to control where and how cracks will occur in concrete. These expansion joints are strategically placed on designs according to recommendations and instructions by a structural engineer. The expansion joint is created by leaving a gap between the bricks of a wall with a polystyrene spacer to ensure the space stays free from mortar and can expand and contract. When the brick wall is plastered, this spacer layer is cut back slightly and the gap is normally filled with a flexible sealant. The settlement cracks are easily addressed with a cosmetic touch up of the crack with a filler and a coat of paint. This makes the gap weatherproof to wind and water, but still allows the expansion joint to move, expand and contract as needed. It is important that this expansion joint is not filled with cement, plaster or any other hard filler. Without an expansion joint, the settlement or movement of the house would cause uneven and much larger, unsightly and possibly structural cracks in your house structure and could cause cracks under tiles and so on. Expansion joints are an important part of a well-designed building. What is a settlement crack? 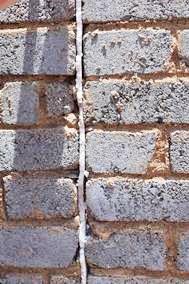 As your new house settles in on its foundations - a process known as settlement - small cracks may develop in or immediately alongside the expansion joint. These cracks are small and narrow. They are perfectly normal in a newly built structure and do not indicate anything structurally wrong with your home. Your home is purpose-built with the expansion joints to ensure that these settlement cracks only occur inside or along the expansion joint. The basics of crack repair are to remove all debris and excavate the crack down to firm material. 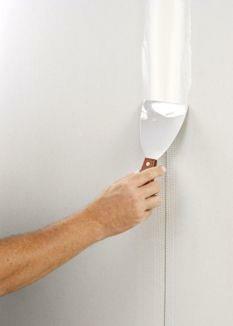 A suitable, flexible crack filler or mortar mix can be used to fill the crack. Once dry, apply a new coat of paint to finish the repair. Remember that it's crucial to give your home the maintenance and care it needs to maintain the value and comfort of your home. Attend to any required repairs and maintenance as soon as they arise to prevent a small problem from becoming a major one, and to protect the value of your property investment.